I picked this movie because it was short.....one hour and twenty minutes. I was at the door waiting for the words THE END to pop up on the screen. No, no, the movie wasn't bad, it's just all the previews and five hundred reminders to silence your cell phone that turned this into a two hour event. I decided to take Crusty with me, since he has an inferiority complex going on. He's easier to smuggle into the theatre than Phillip Johnny Bob.....and JJ is beyond even attempting to smuggle in. Of course, wouldn't you know? My local theatre seems to have a problem with non humans being smuggled in. The nerve! 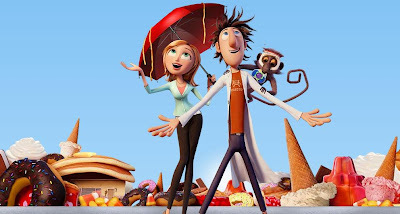 Flint Lockwood lives on a remote island called Sardine Falls, where everything is about sardines....literally. He is a nerdy kid who invents things, but none of them were practical....like spray on shoes. As a grown man, he is still in his own little world or trying to invent something useful with little luck and to his father's dismay. 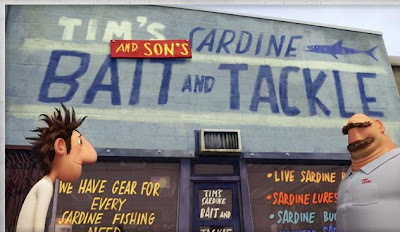 He tries to encourage his son to work in his tackle shop by making him a partner. Flint, feeling like a failure....gives it a whirl.....yeah right. In the mean time.....there's a rookie weather girl, who is sent to this remote island on assignment as a favor to her uncle...or brother. Anyway, she's nerdy and she's sent to do the weather on the island of Sardine Falls. By now, Flint has perfected his invention to turn water into food. And, really? Just tell him what you want and the sky will open up with a plethora of your favorites. Sam Sparks is quite taken by Flint and of course, her home station is amazed at her weather reports. 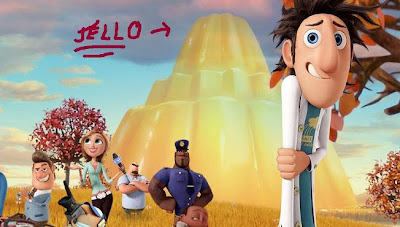 When Flint learns that Sam loves Jello....well yes, he makes her a humongous jello mold. But....as with all good things bigger is better....and the buffet from the skies is getting out of control. The world is being bombarded with giant food...like this fortune cookie and ear of corn on the Great Wall of China. Don't even ask me about what showed up at the Eiffel Tower. It gets redundant and over the top...but kids were going bananas over this movie. Did I mention I saw it in 3-D? Yeah, it's the only way to watch a tornado of spaghetti and meatballs tear through a town. They made sure they got a few pc messages out there. One was the dangers of over eating. Another was the dangers of too much junk food, illustrated by the local police officer's little boy being in a sugar induced coma. I kid you not! 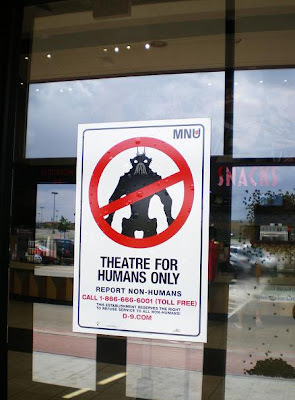 Non humans can't enter your theaters? Isn't that mean??? PSA's are everywhere it seems!!!! Can Crusty come play with me? Sounds a bit like Wall-E with the PSAs! I might see this one. The thought of food coming at me in 3-D is exciting. 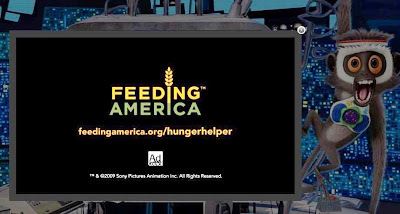 I don't know why they throw PSAs in these animated movies. Little kids don't get it anyway. 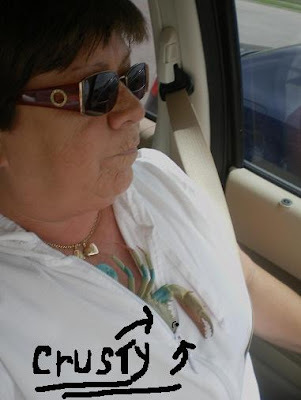 Did Crusty wait in the car of were you able to smuggle him in? I can only imagine him in 3-d glasses swatting his claws at the incoming food. s also. I LOVE Mr. T. The monkey sidekick? Not so much. did you have to pay for Crusty to go to the movies? so are you saying that we will like it? Um my big kid wants to go. She loved the book. yea i bet crusty enjoyed his "peep" show so much he could of cared leas about getting into the movie!!!... you are getting your use out of those 3d glasses!! How does Crusty look in 3D? Little T wants to see this movie!